There is a children’s area at the back of church. Children are welcome to play here or take toys to where you are sitting in the church. 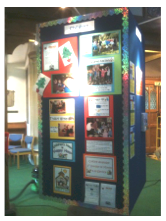 The children’s corner is well used at our 9:30am Sunday service, at weddings, and on many other occasions.